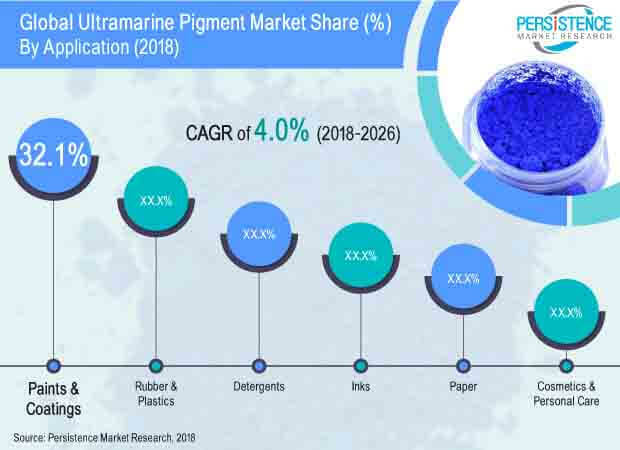 Persistence Market Research (PMR) analyzes the ultramarine pigments market in a new publication titled “Ultramarine Pigments Market Global Industry Analysis 2013–2017 and Forecast 2018–2026”. This study provides data for 2017 along with the forecast for the period from 2018 to 2026. The main objective of the report is to identify dynamics in the market and provide recent updates and insights affecting various segments of the global ultramarine pigments market. To provide a better understanding of the market, the report also includes the analysis of drivers, restraints and trends on all seven regions, namely North America, Latin America, Europe, South East Asia & Pacific, China, India and MEA, which influence the current market scenario and future status of the global ultramarine pigments market over the forecast period. To understand and assess market opportunities and trends, the global ultramarine pigments market report is categorically split into different sections based on market segmentation – by grade, by application by color and, by region. The report starts with the market overview and provides market definition and taxonomy along with value chain, pricing analysis country wise, drivers, restraints and trends in the market. The sections that follow include global ultramarine pigments market analysis – by grade, by application, by color and by region level analysis. All the above sections evaluate the market on the basis of various factors affecting the market. Each section discusses the qualitative and quantitative aspects of the global ultramarine pigments market. To give a brief idea about revenue opportunities from the – grade, application, color and, region segments, the report also provides volume (MT) data, absolute $ opportunity and total incremental opportunity for each segment over the forecast period (2018 – 2026). For market data analysis, we have considered 2017 as the base year with market numbers estimated for 2018 and forecast made for 2018–2026. To calculate the market size, the report considers the weighted average price of laundry, industry and cosmetics grades across key geographies on a country basis. The forecast assesses the total revenue (US$ Mn) as well as volume (MT) of the global ultramarine pigments market. To deduce market volume size, the consumption of ultramarine pigments has been considered. In order to provide an accurate forecast, we have started by sizing up the current market, which forms the basis of how the global ultramarine pigments market is expected to develop in the future. The critical market data, including the base number and segment splits, has been devised through in-depth secondary research. This data is then triangulated on the basis of different verticals, considering both supply side and demand side drivers and other dynamics of the various regional markets, along with primary interviews of manufacturers and industry experts operating in the global ultramarine pigments market. The forecast presented in the report evaluates the actual consumption of ultramarine pigments and expected consumption in the global ultramarine pigments market over the forecast period. We have also analyzed the different segments of the global ultramarine pigments market in terms of basis point share (BPS) to understand individual segments’ relative contribution to market growth. This detailed level of information is important for identifying the various key trends governing the global ultramarine pigments market. The report also analyses the global ultramarine pigments market based on the absolute dollar opportunity, which is usually overlooked while estimating the market forecast. However, from a sales perspective, it is essential to identify potential resources in the ultramarine pigments market. Ultramarine pigments are inorganic pigments added to products to give them a distinctive finish. Ultramarine pigments find applications in rubber & plastics, inks, detergents, paints & coatings, etc. The global ultramarine pigments market was valued at US$ 182.5 Mn in 2017 and is expected to reach US$ 257.9 Mn by the end of 2026, expanding at a CAGR of 4.0% over the forecast period. The global ultramarine pigments market is anticipated to represent an incremental opportunity of US$ 68.8 Mn between 2018 and 2026. In terms of volume, the global ultramarine pigments market is estimated to reach 54,300 tons in 2017 and is anticipated to increase to 70,109 tons by 2026, exhibiting a CAGR of 2.9% over the forecast period. Steady economic growth in developing countries, such as China, India, Brazil and ASEAN countries and rising per capita disposable income and expenditure in these regions are the major drivers for the consumer products market. With growing economic prosperity and increasing purchasing power, people are moving towards the use of products that were earlier unaffordable. This, in turn, has resulted in an increase in the demand for consumer products, such as personal care and home care products, among others. The global ultramarine pigments market can be segmented on the basis of grade, application, color and region. On the basis of grade, the global ultramarine pigments market can be segmented into laundry, industrial and cosmetic grade. Based on the application, the global ultramarine pigment market can be segmented into rubber & plastics, inks, paints & coatings, paper, cosmetics & personal care and detergents. Whereas, based on color, the global ultramarine pigments market can be segmented into blue, violet and others. Significant regions covered in the report include North America, Latin America, Europe, South East Asia & Pacific, China, India and Middle East & Africa. Among the application segments, the paints & coatings segment, followed by the rubber & plastics segment, dominated the global ultramarine pigments market in 2017. The rubber & plastics segment is forecast to account for a 26.4% market volume share by the end of 2026. The growth of the segment is largely attributed to the increasing demand from end use industries. The ink segment is also anticipated to grow at a good pace over the forecast period, owing to the growing demand from electronic media across the globe. From a regional perspective, China represented approximately one-third of the market volume share in 2017. The market is expected to increase at a value CAGR of 4.0% over the forecast period. Sales revenue of the ultramarine pigments market in Europe is expected to reach US$ 61.1 Mn by the end of 2026, increasing at a CAGR of 2.8% over the forecast period. Market growth in North America is expected to remain moderate as compared to the global average between 2018 and 2026.